Cracks in your plaster? Act now to prevent your home becoming a leaky building. 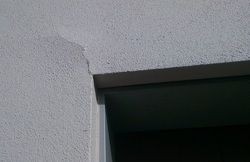 Generally, small cracks can be easily repaired. By acting before a major leak develops you can save yourself thousands of dollars in the long run. Texmark Coatings provide inspection services and we are able to offer advice or provide a quote if repairs are necessary. We recommend that you inspect your property for cracks, signs of leaks, or other damage, at least once a year. Paint is a major component in keeping you home waterproofed and should be cleaned with a low pressure wash annually. Paint plays an important part in keeping plaster cladding systems watertight. It's your home's first defence against water penetration. We recommend repainting your plaster home every 5-7 years with a 100% acrylic waterproof membrane paint. When you undertake a repaint it's a good idea to reseal around windows and doors first. Texmark Coatings can repaint your plaster home in accordance with the manufacturer's specifications. We can offer advice about colour selection and inspect your home for cracks, damage or missing sealant prior to repainting.